Have you ever heard of snow cream? Well, it’s the tasty treat taking over Instagram, but there are some health risks to eating snow ice cream that you should hear. We don’t want to be a Debbie Downer, but that glorious invention that combines your love of ice cream and the snow from winter, isn’t exactly good for you. Growing up, we know you wanted to eat snow when it poured down during the winters months. 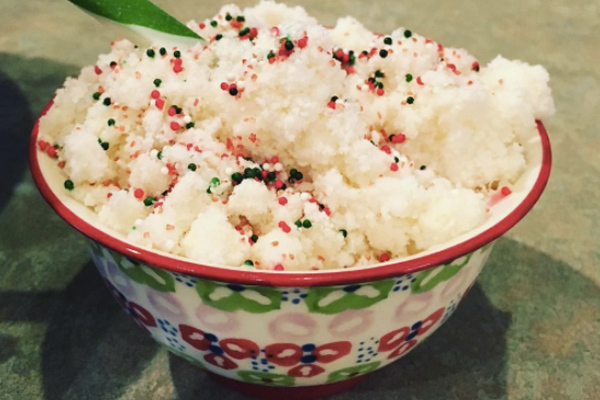 You are clearly not alone, because people are now creating “snow cream,” which is edible snow! While the trend of #SnowCream has taken over Instagram and looks delicious, we have a health warning you should listen to. A study from Environmental & Sciences: Processes and Impacts in Publishing has proven that making snow into food isn’t exactly the best life choice. The scientists who conducted the study found that snow actually “absorbs toxic organic compounds” from vehicle exhaust. Would you eat ice cream that sat behind an exhaust pipe? No, so this isn’t the sort of thing you should eat either. While snow cream is a yummy combo of snow, condensed milk, vanilla, sugar and sprinkles, it comes with outside elements that are gross. In a separate article, TIME revealed that snowflakes (like snow) begin high in the atmosphere. When the snowflakes hit the ground, they’ve had a LOT of time to accumulate more crystals (more than its original crystals that form from water vapor condensing), resulting in gaseous elements and contaminates. Again, we’re sorry to ruin this trend for you, but sometimes the truth hurts. Plus, eating snow is cold and messy. So next time consider buying actual ice cream or make homemade flavors with actual ice? It’s still delicious and, in many ways, much better for you.